Here’s my review for The Apothecary. Enjoy! When Janie moves to England from California, her life changes. She meets a boy named Benjamin Burrows, who doesn’t go under the tables during bomb drills, and who’s father is an apothecary. When the apothecary is kidnapped and they get their hands on an ancient book with potions and spells, their lives are changed forever. They are being chased by their Soviet Latin teacher, Mr. Danby, Jin Lo, a chemist is kidnapped, and the gardner at the Physic Garden is murdered. On a quest to stop an atomic bomb, they use a variety of magical concoctions to pursue their goal. In a stunning series of events with unexpected twists and turns in the plot, you never know who you can trust-or you might die. WIll they stop the atomic bomb, or will they all die because of it? Maile Meloy is an amazing author. 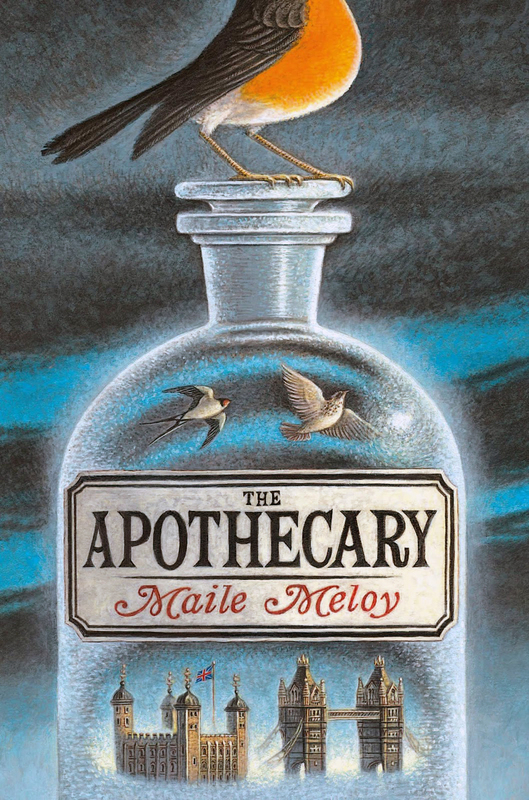 The Apothecary had me turning pages like there is no tomorrow; very well written and beautifully illustrated. I loved that it was set in 1952, it was interesting to have it set right after world war II. Also, I loved all the potions and magic and suspense in the book; it reminded me a little of Harry Potter. This was the first book I have read by Maile Meloy, and I merely checked it out of the library because of the wonderful cover art. I didn’t even look at the blurb, the cover was enough to capture my attention. And, yes, people, I can prove you wrong when you say you can’t judge a book by its cover. Because I do it all the time. I think the cover of a book is more important than the blurb, or the first sentence. Every book I judge by the cover has gotten a great review from me. You may say it’s just luck, but I’d say it’s a good eye. I am looking forward to the next book in the series due this summer. Next I will be reviewing Caught. Remember, comment on what books I should read next! Yet another wonderful summary and insightful review. Are there widgets you can add to your blog so people can like your posts on Facebook and email the link to their friends. It would be a way for people to easily share your work with their friends who enjoy reading. Keep up the fantastic work!